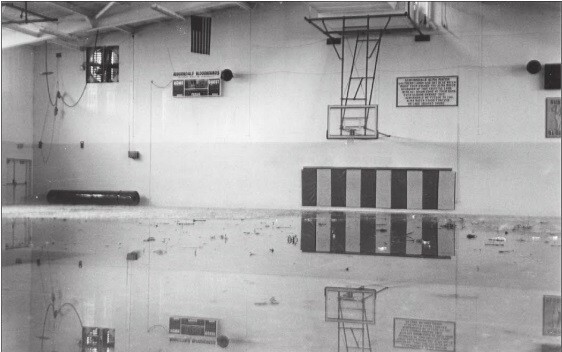 The gym with a foot of water standing in it following the tornado. May 8, 1979 proved to a disastrous one in Auburndale’s history. A tornado ripped through the town, from K-Ville through towards Lake Alfred, destroying everything in its path. The bulk of the damage to the local schools came when it tore the roof of the nearby Auburndale Middle School, at the time being used as a 7th grade center, condemning the buildings. This would eventually necessitate the building of Stambaugh Middle School five years later. While Auburndale High School did not take a direct hit, it certainly felt a thrashing. View the gallery below to see damage around campus from that day.